Looking for Christmas decorations or gifts? Join us for coffee and a morning of ‘Christmas discoveries’ in the Prati/Trionfale neighbourhood. Our CCR neighbourhood shopper will take us to the Mercato dei Fiori (flower market) where, every Tuesday morning, the public can purchase cut flowers and plants at wholesale prices. 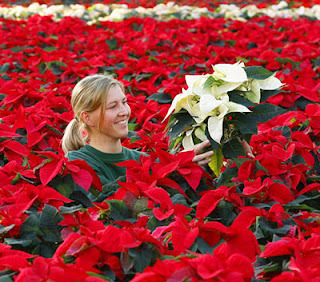 The market is ready for the holidays with an abundance of gorgeous poinsettias of every size and a good selection of plants ideal for gifts. And in keeping with the Christmas theme, we will visit local shops specializing in Christmas decorations, artificial flowers, Christmas trees and much more to bring the holiday spirit to your home. Where: A coffee bar in the neighbourhood (details will be sent to participants). If you are coming by car, we will send information on parking.